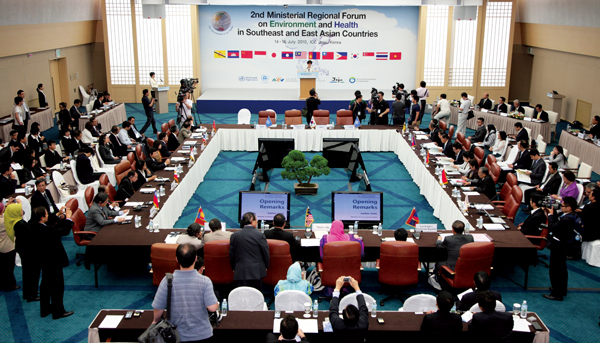 The Second Ministerial Regional Forum on Environment and Health in Southeast and East Asian Countries was held at the Jeju International Convention Center from July 14 through 16. South Korea’s Minister of the Environment, Lee Maanee, and the Minister of Health and Welfare, Jeon Jae Hee, delegations from 14 Asian nations and about 200 experts from home and abroad participated in the forum. They reviewed the implementation of each nation’s environmental health action plans, sharing experience and knowledge to enhance each country’s capacity to manage the environment and health. “According to The World Health Organization, 24 percent of all diseases and 23 percent of deaths in the world are attributable to environmental factors,” Jeon said. “They are known to be blamed for 36 percent of the deaths of children, which speaks volumes about the necessity to protect vulnerable groups.” She stressed the need for close coordination on the problem by the global community. “Strengthening environmental health policies, cooperation between environment and health sectors and between countries is crucial to effectively achieving health-related Millennium Development Goals, aimed at reducing infants and child mortality, improving maternal health and combating infectious diseases such as malaria,” she said. The three-day forum ended with the adoption of the Jeju Declaration on Environment and Health, which reaffirmed the Asian nations’ commitment to the enhancement of capacity to manage environment and health factors. Through the Jeju Declaration, the participating ministers agreed to establish a transnational task force to tackle environment and health concerns, especially those of air quality, water, sanitation and hygiene, solid and hazardous waste, toxic chemicals and hazardous substances, climate change, ozone depletion and ecosystem change, as well as environmental health emergencies. The result of the ministerial meeting will be evaluated and continued by a thematic working group for each field. The United Nations Environmental Program and WHO have been designated as secretariat in support of further cooperation at the regional level. The forum also agreed to form a health impact analysis team to evaluate the impacts of various environmental factors affecting human health. The 14 participating countries were South Korea, Japan, China, Mongolia, Myanmar, Lao People’s Democratic Republic, Vietnam, Brunei, Philippines, Indonesia, Singapore, Malaysia, Cambodia and Thailand. The Ministerial Regional Forum on Environment and Health in Southeast and East Asian Countries which was first held in Bangkok in August 2007 takes place every three years. The next ministerial forum is scheduled to be held in Malaysia in 2013.